Meeting and assistance upon arrival & transfer to your hotel Ratan Vilas, exudes an aura distinctly its own - enhanced by its rich and varied collection of paintings, treasure troves and hunting trophies of yesteryear. Everything is well preserved by the royal family, which still uses a part of the building as its home. The magnificent sandstone building, built for Sir Ratan Singhji, the Maharajadhiraj of Jodhpur, tastefully blends the lavish interiors and modern comforts. 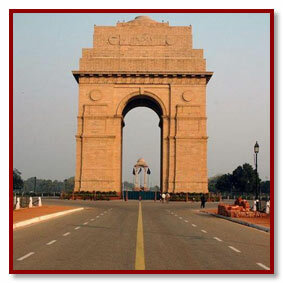 Present day facilities are harmonized so as not to disturb the antiquity of the royal abode. Late afternoon, we would ride horse carriages to the Clock Tower Bazaar. This is one of India’s largest and most colourful wholesale markets especially with respect to clothes, fabrics, spices, vegetables etc. It is a fantastic experience to walk through the place observing and photographing this incredible spectacle of vibrant lifestyles and incredible colours. Upon arrival, check in to Hotel Heritage Inn, a modern hotel with an ethnic touch, this hotel has been synonymous with warm hospitality, quality service, and modern amenities. Rest of the day is at leisure. 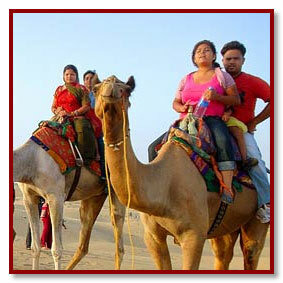 We suggest you walk along the old city to explore traditional and typical Jaisalmer. The havelis (mansions) in a beautiful state of preservation are a fascinating sight. After a leisurely breakfast, we visit the residential portions of the fort where one third of the population of the old city lives. The design of houses remains, as they were a couple of century’s back and so are the lifestyle of people occupying them. This is because most of the families continue to work for generations for the rural (though only titular now) hence there is a sense of continuity. The houses are arranged in narrow lanes and have small windows from where the shy child or the girl peeps. This is the city believed to be the home of the most handsome men and women in Rajasthan. After a leisurely breakfast, we will partly drive & partly ride camel to Sam, a dessert outpost. Enroute we visit a few typical dessert villages, which have a sprinkling of huts. The rough terrain here does not support cultivation, hence the entire village work as causal labourers in road works or community projects. Inspite of their poverty and hard life the people are very friendly and seem to be aware that they are proud owners of very expressive and beautiful faces. We reach on to Sam where we explore the dessert on camel back. Against the backdrop of the setting sun and the huge expanse of the dessert the camels with their long shadows would be excellent pictures. We will stay overnight at Sam. 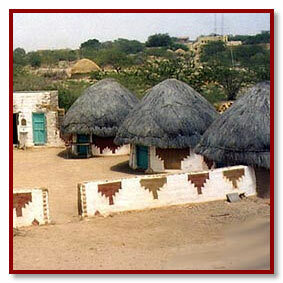 Special tents would be provided for us where local Rajasthanis would prepare mouth-watering Rajasthani food. The stillness of the night, the clear dessert sky, the campfire, local Rajasthani music and the general atmosphere, make the place a very romantic experience. After a leisurely breakfast we will partly drive & partly ride camel to Khuri, a fascinating desert village dunes of Khuri, located near sand dunes for another 'Indian experience', and, a memory to be treasured. The friendly locals would invite you into their simple homes, little mud houses with earthen floors, no electricity or running water. The women walk two kilometres to the well & carry the water home on their heads. Life is very primitive here restricted to basic activities centered around the little mud hut. The rough terrain here does not support cultivation, hence the entire village work as causal labourers in road works or community projects. Inspite of their poverty and hard life the people are very friendly and seem to be aware that they are proud owners of very expressive and beautiful faces. In the evening we explore the dessert on camel back. Against the backdrop of the setting sun and the huge expanse of the dessert the camels with their long shadows would be excellent pictures. The stillness of the dessert, the clear sky, local Rajasthani music and the general atmosphere, make the place a very romantic experience.